Our patented Adjustable Tablet Holder is a quality product that our factory constructed from all stainless steel. The sleek design is a perfect match for the most elegant tablets. Benefit from the hands-free convenience of our fastest selling product and save $5! This product provides eye-level viewing of your tablet on trains, in cabs, buses and other vehicles. 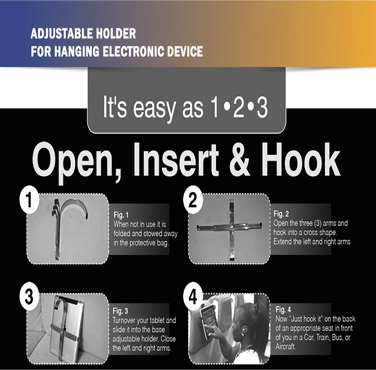 Simply secure your device in our universal tablet holder for hands-free viewing. Our product is adjustable to fit iPad®, Kindle®, Nook® and other tablets.